In a series of decisions, Loveland, Colorado’s City Council voted earlier this week to take the next step toward developing a municipal broadband network. In addition to allocating funds to develop a business plan, city leadership established an advisory board, accepted task force recommendations, and voted to amended current code to allow the electric utility to handle communications activities. The council addressed whether or not to ask voters to approve efforts to establish a municipal broadband network, even though the issue was not part of the agenda. City staff drafted an amendment during the meeting to require a vote, but after prolonged discussion City Council members voted 5-4 against including it. Last fall, the city of Fort Collins needed to bring the issue before voters in order to amend their charter so community leaders could move forward with a municipal network. 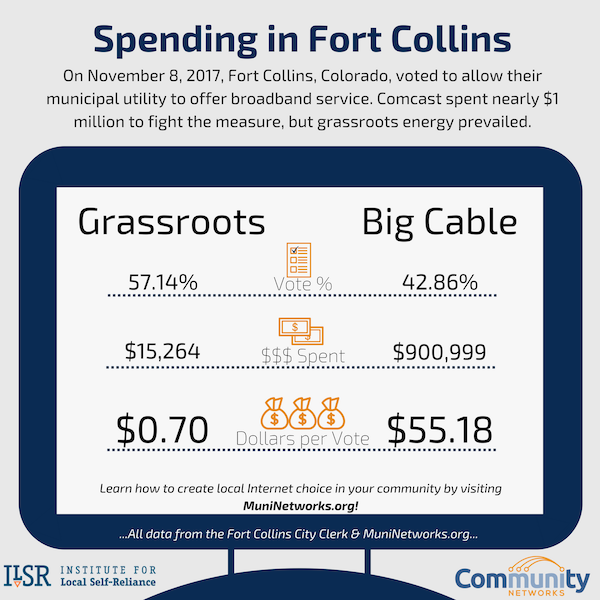 After spending more than $900,000 through a bogus citizens group to try to stop the measure, Comcast was unable to persuade Fort Collins to defeat it. Nevertheless, most of Loveland’s council members don’t want a repeat of the expensive hassle in Fort Collins. Councilman John Fogle said that, prior to the Fort Collins election, he supported the idea of a vote on the issue, but he feels different now. "It's not an even playing field when incumbent industries will spend $900,000 at the drop of the hat to perpetuate ... a monopoly," he said at the February 6th Council meeting.